To you, this looks like a regular, every day piece of bubblegum. What else could it be, right? To me, this looks like a lovely memory. A smile. A curiosity. A piece of my history. Ron, a cousin I barely know, gave it to me today at our family reunion. He could barely contain his enthusiasm. He was joyful and generous. Just like my great-uncle Dave. He was my great-grandmother’s brother. I remember him for his smile and good humor. And I remember him for his bubblegum. Whenever I saw him, he gave me a piece. His pockets were always full of it. He always had enough for every kid there. Every kid. I’m sure he had many other redeeming qualities. But that’s what I remember. The bubblegum. 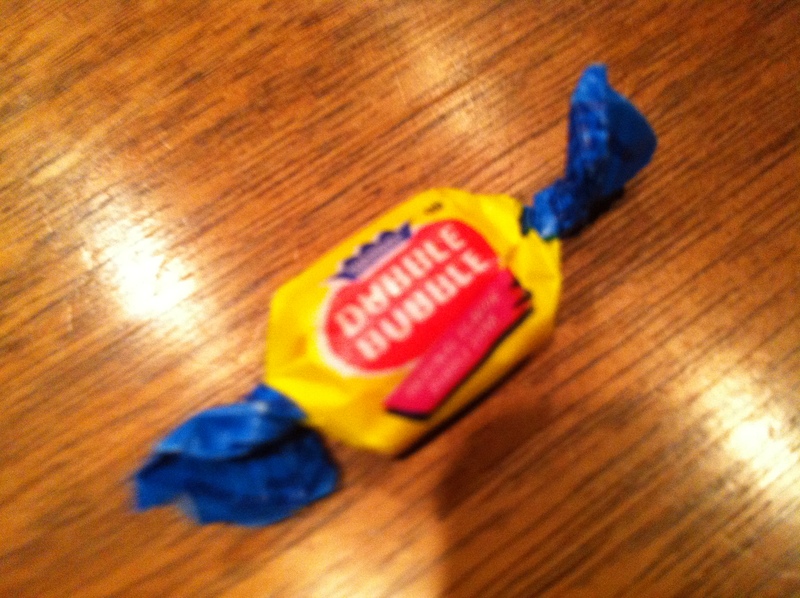 So when Ron reached into his pocket today at the big reunion and pulled out a piece of Dubble Bubble, I was five again. And remembering the beige and rust colored carpet in the small den at my grandparents’ house. The house they shared with my great-grandparents. I sat on the carpet near the tv and the partition to the kitchen area. There was a soft tweed chair in the corner that rocked. That’s where Uncle Dave was. On the chair. I don’t remember him anywhere else except the corner of that room – that room with the plant vines growing up the doorway that led to the bedrooms and the bathroom. And that bathroom, where so many mysteries could be found under the counter and in the cabinets under the sink that opened in odd ways. Those cabinet and drawers were filled with cremes I’d never heard of and sprays I didn’t understand. And the pièce de résistance was the Water Pik with all its accoutrements. Today, I spent time with Uncle Dave’s family; the people who knew him well. I don’t know who he was any more than I did before. But I have strong and warm feelings for his descendants – most of all, my cousin Eric, who holds a special place in my heart and on my Facebook page. And that tells me that it’s likely that Uncle Dave was as great as the glimmer of my memory of him. < I just wish everyone could be there. that was a great reunion! i love this. what a great memory. those are the moments that really matter. glad you enjoyed yourself! I shared the very same feelings about you today. Reading your entry today about my Uncle Ron and my Zadie made me cry. During my zadie’s funeral I let myself go one time and cried heavy and someone grabbed me and hugged me so tight – I felt warmth and consolation then like never before. It was Ron…small world. (hug) That guy sure does have a big heart. lovely story! memories to treasure. your boys will always remember this!